Following our guidelines, you will become an expert in selecting the perfect ham for rave reviews! Knowing how to buy a ham comes down to two preferences: flavor and cooking time. 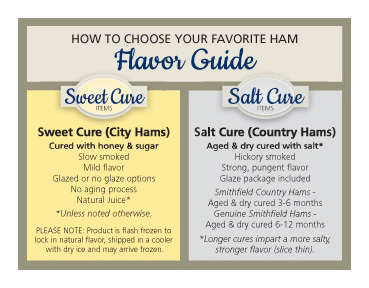 Below, you will find flavor and cooking descriptions of our most popular hams so you can buy the ham that’s best for you and your family. Our lean and mild spiral sliced hams are slow-smoked, carefully trimmed, and fully cooked - ready to eat. Full of natural juices with no water added. Also available with honey cure, brown sugar cure, and various glaze options. Our hardwood smoked ham is also fully cooked, unsliced, water added, and unglazed. It is ready for your own special touches. Serve warm or cold. These are not salt-cured, and should be kept refrigerated and consumed promptly. 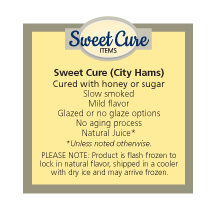 Shop for Sweet Cure City Hams here! Our Genuine Smithfield Ham is the "Granddaddy" of country hams. These dry-cured long cut hams are hand rubbed generously with salt, black pepper coated, and gently hardwood smoked for 6-12 months. Proper aging enhances this flavorful, robust tasting dry-cured ham with the highest salt content for extended keeping quality. Buy this ham if you want bold flavor and the genuine ham experience. 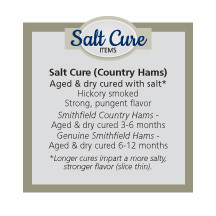 Our Country Hams are dry-cured the same as above, but with a shorter shank, the aitch bone removed, and a shorter curing process - only 3-6 months. This results in a more subtle, milder flavor than the Smithfield Ham and less salt content. Slice paper thin. Serve at room temperature. Shop for Country Hams here! Read our FAQS and Cooking Tips for information on how to prepare, store and carve your ham!